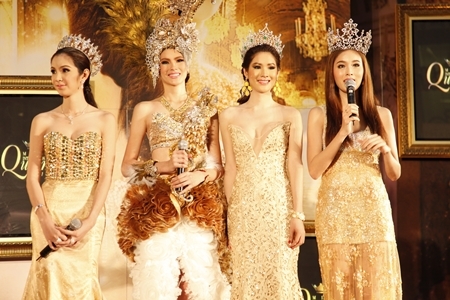 Every year for the past 7 years the spectacular “Miss International Queen” transgender beauty pageant has been hosted by Tiffany’s Show in Pattaya. This year, candidates from more than 20 countries are joining the pageant for the chance to be crowned – Miss International Queen 2012. Former winners of the “Miss International Queen” contest address the media at a press conference held Oct. 10 at Central World in Bangkok. All the contestants will attend the orientation and beauty camp on Sunday 28th October at Woodland Hotel Resort in Pattaya before doing a whistle stop tour of the city’s tourist attractions including, Koh Larn, Ripley’s Believe It or Not! Museum and World Gems Collection. On Tuesday 30th October, the “Best Kiss Talent Contest 2012” will take place at Aksara Theater, Bangkok followed by another beauty camp and finally the crowning awards ceremony will be held on Friday, 2th November at Tiffany’s Show Pattaya. Part of profits from this event will be donated to The Chaipattana Foundation. Members of the public can also participate by voting for their favorite contestants through Ripley’s Believe It or Not! Pattaya’s facebook fan page (www.facebook .com/ripleysworldpattaya). The contestant who gets the highest vote will be awarded the Miss Ripley’s Popular Vote. A live broadcast of Miss International Queen 2012 will be shown on Modern 9 TV on Friday, 2th November. Those interested in attending can book a ticket at Tiffany’s Show Theater Pattaya and all branches of Thai Ticket Major or www. thaiticketmajor.com.